The Great Holiday Give has come to an end. To send us into the weekend properly, the last give comes from the spectacular Purple House Press... Time at the Top & All in Good Time, two novels by Edward Ormondroyd. 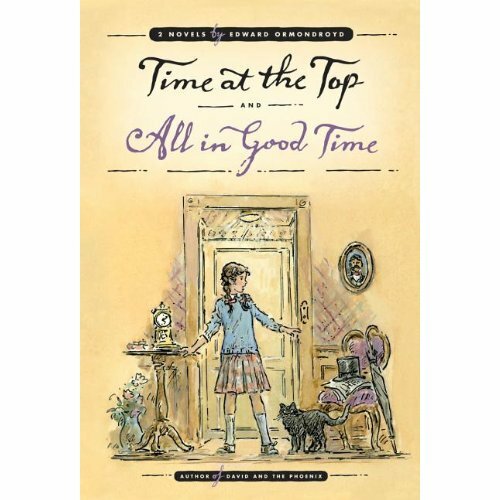 For the first time ever, you will be able to read Time at the Top ('63) and its sequel All in Good Time ('75) in a single volume, to get the complete story of time traveling Susan Shaw! All you have to do to be entered to win this brand new reprint is comment on this post by 11:59 PM Sunday, December 4. A winner will be selected at random and announced (along with all the other winners from the week) on Monday, December 5. This book was sent to me by the publisher to giveaway, but I don't think I need to tell you that this in no way educated my opinion of the publisher or the title in question. I've been bragging on these guys since the beginning of time! There are some great books on here this week, and I'm making sure I throw my name into the hat for the ones we don't own already! Thank you again! I was just reading up on Time at the Top on amazon the other day! I love the books I've gotten from Purple House Press thus far, and I'm sure I would love this one as well! I've never heard of these books, but my daughter is now an avid reader and it would be so fun to read this together. Thanks for another great giveaway! Another sweet stocking stuffer, thanks. yes, please! if I win then this one is totally all for me. If I don't win then I may have to just buy it for myself. I love purple house press! Hope never dies! I hope I win and thanks for the opportunity! My daughter would love these bks. What a fun selection of books for the holiday give this week! Thanks for the excitement. This one sounds really good! Thanks again for the chance to win! Great, looking forward to this one. Have never heard of them, but they sound terrific. Never heard of this one, but it looks wonderful. Off to find out more about it. Thanks! I've never heard of these books, but if it's on this blog, I know it's worth reading. It sounds like something I'd love! That title sounds so familiar! I wonder if I read it as a kid, then forgot it? we would love this in our household! Five days of great giveaways . ..I'm in for day 5 as well! Don't know these, and love to discover new great reads! (And of course I love a good purple house!) Thanks for the chance! I bet my daughter would love these. Wow. I read David and the Phoenix last summer, and these two time books of his are way up on my reading list! This looks like it would be right up my alley. Thanks so much for all these give aways - so many great ones this week! I've never heard of these. They sound great! Oh that for once I would be picked... well, if not... Blessings and early congrats to the winner!! I would really love to win these books, some titles I've never heard of. Cheers. I would love to win. Thanks for the opportunity and the awesome blog! Love Purple House Press--their mission to bring back out-of-print books is awesome.